Contract Logix is a long-time innovator and developer of Contract Lifecycle Management (CLM) software. Founded in 2006, Contract Logix provides powerful solutions that enable organizations to boost efficiency in their contracting processes, while mitigating legal and financial risk. It is ideal for organizations using manual contract management processes that result in scattered contracts. Contract Logix solutions address the common pain point of searching for the most recent copy of an agreement only to find it’s stored solely on one person’s hard drive, while providing automatic alerts of important contract-related dates, ensuring you never miss a deadline or auto-renewal. Contract Logix solutions help you get a handle on all your agreements and associated documents, ensuring that your contracts are always at your fingertips and you never miss another important deadline. It all starts with a secure electronic repository for all of your agreements and associated documents and data. 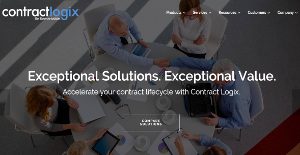 Whether your needs are simple or complex, Contract Logix can help you take control of your contracts and gain efficiency in your related processes. If you are considering Contract Logix it could also be a good idea to check out other subcategories of Best Contract Lifecycle Management Software listed in our base of B2B software reviews. Since each company has unique business needs, it is advisable for them to abstain from seeking a one-size-fits-all ideal software system. Needless to say, it would be futile to try to find such an app even among market-leading software applications. The intelligent thing to do would be to list the various vital factors that need consideration such as required features, finances, skill levels of workers, company size etc. Then, you should do your research thoroughly. Read some Contract Logix reviews and look into each of the other solutions in your shortlist in detail. Such in-depth homework can make sure you weed out ill-fitting platforms and zero in on the app that offers all the aspects you need for business success. How Much Does Contract Logix Cost? Contract Logix’s SMB and enterprise pricing information is available only upon request. Contact the company for more details, and ask for your quote. We realize that when you make a decision to buy Contract Lifecycle Management Software it’s important not only to see how experts evaluate it in their reviews, but also to find out if the real people and companies that buy it are actually satisfied with the product. That’s why we’ve created our behavior-based Customer Satisfaction Algorithm™ that gathers customer reviews, comments and Contract Logix reviews across a wide range of social media sites. The data is then presented in an easy to digest form showing how many people had positive and negative experience with Contract Logix. With that information at hand you should be equipped to make an informed buying decision that you won’t regret. What are Contract Logix pricing details? What integrations are available for Contract Logix? Contract Logix is an open API system that can be integrated easily with a variety of email, accounting, and active directory systems. If you need more information about Contract Logix or you simply have a question let us know what you need and we’ll forward your request directly to the vendor.